GET GLAMMED UP BY US, WITH US! Have a special occasion coming up and need a makeup artist? Stop by Brow & Beyond, we'll make sure your makeup is done right! From simple application to wedding parties- we offer many services for your makeup needs. Need help applying your makeup? Bring in what you have and we'll work with you! Need a soft look, go for our light makeup package for just the right subtlety! Machine-Powered technology used to create hyper-realistic looking HD Brows. Download our free face chart. Print out face chart. Fill it out with your favourite makeup, if you have an idea of how you want your make up-draw it! Bring in your face chart, along with your makeup (optional), during your next visit. We'll give you that look! 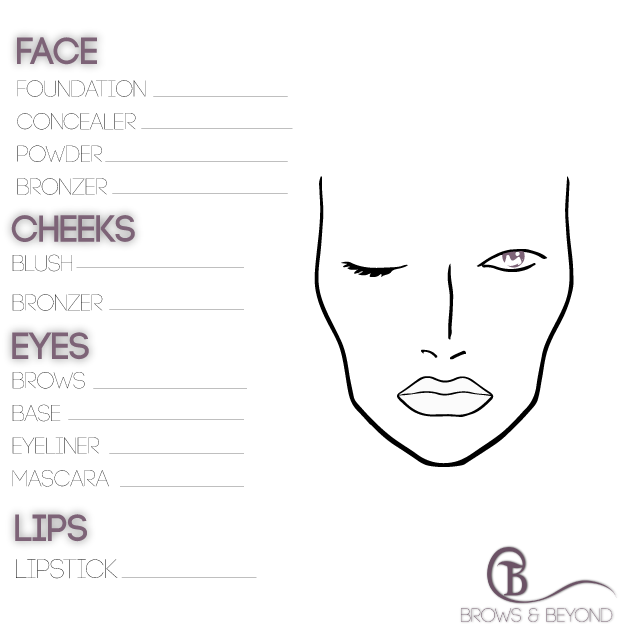 ENTER YOUR EMAIL BELOW & DOWNLOAD YOUR FACECHART!